About thirty volunteers braved the drizzle, then the steady rain on Saturday morning for Wayland Cleans Up! The communal clean-up used to be a popular yearly event. When the Wayland Democrats approached the Wayland Green Team and Transition Wayland about reviving it, the three organizations decided to put their shoulders to it, with some help from Cliff Kolovson, who used to organize it. At two stations participants were given bags for recycling and for trash along with directions to the most “troubled” areas in town. They could then leave the bags along the road, where the organizers rounded them up, or take them to the Transfer Station, which exceptionally accepted the trash in plain bags. Among those were families with kids, and a couple of Boy Scouts. “Despite the rain, looking at the clean road after we finished really made it worth it!” said Erik Swanke, the Leave No Trace Coordinator for Troop 1 Boy Scouts, who cleaned up along Old Sudbury Road with Collin Hess. “We found hundreds of cigarette butts! People smoke too much,” concluded Amie Ghosh, ten, who took care of Old Connecticut Path around Mainstone Farm with her dad. Other common items were liquor bottles small and large, soda and beer cans, polystyrene coffee cups and food wrappers, and plenty of plastic water bottles and plastic bags. “Too much plastic,” agreed Robi Zallen and Joan Blair, two of a group from the Wayland Democratic Town Committee taking care of the area around the Town Building, Route 20 near the Transfer Station, and Glezen Lane. “It is time for the town to consider a no plastic bag ordinance,” they commented. That would not be such an outlandish suggestion. Bans on plastic bags are growing across the Commonwealth. Eighteen towns have bans on plastic carry-out bags, six towns (including Wellesley and Framingham) have bag bans on their warrants for Town Meeting this spring, and four towns (including Concord) are considering a ban on polystyrene take-outs. In the end the rain didn’t help. “Mother Nature decides,” said Linda Segal, who took on the Loker area, “and after last year’s drought we can use the rain.” Still, however diminished by the weather, the effort clearly showed. “The area around Whole Foods looks a Whole lot better,” quipped a grateful Jennifer Riley. This year, Earth Day will be Earth Month! 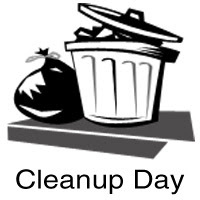 We will kick off with a co-sponsored town-wide Clean-Up on April 2. All month long we’ll have open houses, open neighborhoods, and many more events. Check our schedule as it comes together. Have an energy efficient home? A flourishing garden? ideas and suggestions? Email us at info@transitionwayland.org.